The Washington Post ran an interesting article the other day about hand binding at GPO – specifically, the finishing our Bindery does for the White House on presentation copies of the Public Papers of the President – including hand-tooled goatskin leather, marbled edges, and silk moiré endpapers. Happily, this kind of artistry is still valued by the Government, even in this digital age. For many years, apprentice printers at GPO have studied bookbinding as one of the graphic arts. Since binding is a material rather than a digital process, reading the 1950 edition of GPO’s Theory and Practice of Bookbinding (left) still provides a pretty good introduction to the work we do today for such publications as the Public Papers and Jefferson’s Manual of parliamentary procedure, developed by Thomas Jefferson and still used by the House of Representatives (here’s a nice video on the handwork involved in binding the Manual). 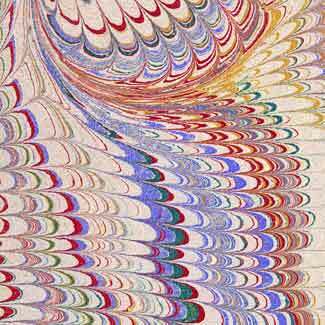 Take marbling, for instance. According to Theory and Practice of Bookbinding, “marbling and gilding are complicated processes and a bookbinder who can do both well is a rarity. In fact, the majority of modern bookbinders can do neither” – and that was in 1950! As is evident in the post article and the video, we still know how to do it today. 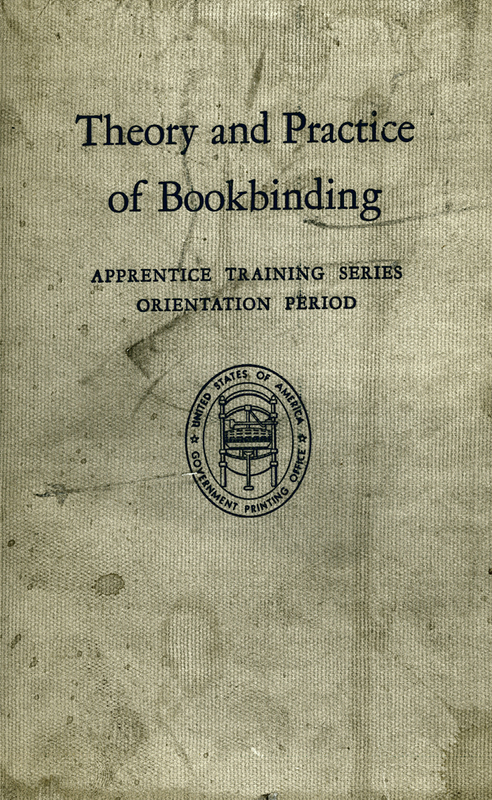 This 60-year old guide to binding also covers even more esoteric book arts. In fore-edge painting, the top edge of a book is scraped and tied, and a watercolor picture is painted on the fanned edges (how cool is that?). Do you need some goffering? That’s a decoration produced by denting the edge after it’s gilded. I don’t know if GPO has ever done fore-edge painting, but the apprentices here had to know ALL of the terms and techniques of their craft. When you’re in an arts and crafts mood, or if you’re like me and enjoy all kinds of obscure information about books and their making, the Theory and Practice of Bookbinding is well worth a browse. You can find copies of various editions on used book Web sites at very reasonable prices, or in a library. This entry was posted on Thursday, December 30th, 2010 at 10:07 am and is filed under Government Printing Office (GPO). You can follow any responses to this entry through the RSS 2.0 feed. You can leave a response, or trackback from your own site. Hello there! I just would like to give you a big thumbs up for the great info you have got here on this post. I am returning to your website for more soon. Part of my growing up years involved knowing some printing, marbling and binding people and watching them at work. I’m glad this still goes on. Very interesting post, I didn´t know nothing about this. Thank you for the information. Older books were often decorated. If you had money up the wazoo, you might have paid for a jeweled binding. Here, precious stones and gilt metal plates were worked into the covers. Sometimes ivory and enamel work were used. These bindings were often the work of silversmiths, goldsmiths and jewelers, rather than bookbinders. Sometimes they are also called treasure bindings, which sounds much more piratical. I was wondering on a similar note,, I am an Editor for my faculty newspaper (soon to be Editor-in-Chief). I desired to make absolutely sure it is a good artwork that counts in direction of my university conditions. My counselor stated it did, but I am even now skeptical, are there any considerably more credible resources? Make sure you do not just give me a internet site. http://hdl.handle.net/2027/mdp.39015018623861. This is a good source for older digitized government documents! Thanks very much! Hathi Trust is indeed a great source. THIS PUBLICATION , “THEORY AND PRACTICE OF BOOKBINDING” , IS A REALY WORK VALUE OF ATTENTION!VIRTUALLY , EVERYTHING LASTS ΙΝ ΤΙΜΕ…JUST WORTH! Electronic!!! book on book binding. I have always been interested in the Art of Book binding. I made my first one when I was in 5th grade. I am a senior citizen now. I would like very much to learn about the proper way to do this art work. Sorry about the previous post…I have ‘FAT FINGERS’ today..my statement should have read…I am looking for employment in the Printing+Bindery field. Thank you….but this site you posted does not open? Can you review it and post it again…I appreciate it and thank you once again in advance. The link is correct and it opens for me. Another approach is to go to GPO’s main page and click on the Careers tab at the top. I really am looking for employment in the printing+binery field??? Anything in the New Hampshire area?? That’s the reason I bookmarked this post. It would be even more useful if the publication was electronically available. I didn’t have any luck finding it online.